Does the task of Passover seem daunting? With all the cooking, preparations, and the cleaning, it can seem like an endless list of tasks. Here is a quick guide on how to search for chametz that will remove a bit of the pressure from your Pesach to-do list. The Torah says, Lo yera'eh lecha chametz, velo yeraeh lecha se'or bechol gevulech, which roughly translates to "Neither chametz (anything leavened) nor se'or (highly fermented sourdough that is used to make another dough ferment) shall be visible to you in all your boundaries." Essentially, during the days of Passover, the home must be completely clean of anything with barley, wheat, spelt, oats, or rye. 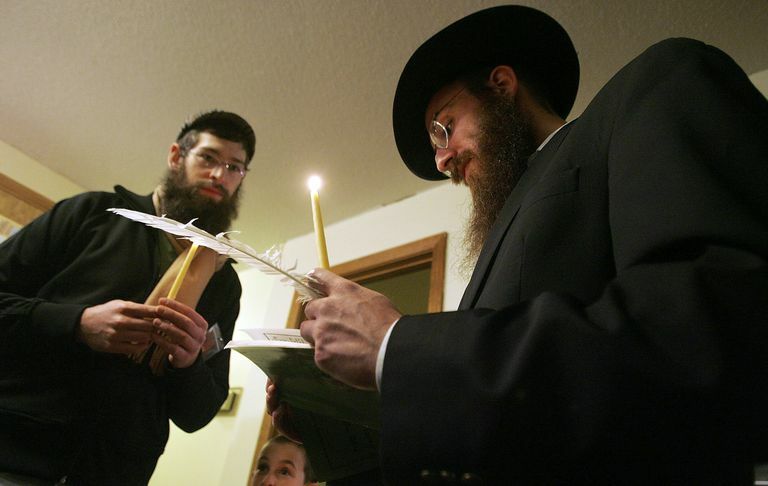 Thus, the night before Passover begins, Jews the world over search their homes to find any and all chametz,which is typically gathered with the rest of the community's chametz and then burned. There is a small loop hole in which most, if not all, Jews "sell" their chametz, in case they missed any in their search or if they can't afford to completely rid their home of chametz. In either situation, all chametz must be put away for the duration of Passover and absolutely none can be consumed. If you're searching your home for chametz, here's a quick "how to" rundown for the tradition of bedikat chametz. Leading up to Passover, the home should be thoroughly cleaned to make sure there is no chametz in the home. This involves vacuuming, checking couch cushions, children's toy chests, and more. The night before Passover begins, any chametz that will be eaten later that night or the next morning before the prohibition against chametz begins should be put together in one designated area. Set aside several pieces (typically 10) that will be purposely placed around the home for the official chametz search. Traditionally, the search for chametz is done with a wooden spoon, candle, paper bag, and feather, but you can use whatever you have on hand to do the search. Place pieces of chametz that do not make crumbs (e.g., a bit of stale bread) in ten different places around the house. The chametz can be wrapped in paper or foil. Why? Chametz is hidden so that the searcher will have something to find, and the blessing will not be said in vain. Turn off the lights in the house, and light the candle. In the room in which the search will begin, the head of the family should say: ברוך אתה ה' אלוקינו מלך העולם אשר קדשנו במצותיו וצונו על בעור חמץ or "Baruch atah, Adonai, Eloheinu melech ha’olom asher kideshanu b'mitzvotav v'tzivanu al bi’ur chametz." This translates to "Blessed are you Lord our God, King of the Universe, who has sanctified us with His commandments and commanded us to burn chametz." There should be no talking between the blessing and the start of the search. During the search, it is only permitted to talk about things directly related to the search. Walking with the lit candle, search through every room in the house, looking in all corners, for chametz. You might even find a piece of chametz that you didn't plant! So be diligent. When a piece of chametz is found, use the feather or another item (not your hands) to sweep the chametz into the paper bag. When all the chametz has been found and gathered, the following is said: "כל חמירא וחמיעא דאיכא ברשותי, דלא חזיתיה ודלא בערתיה, לבטיל ולהוי הפקר כעפרא דארעא" or "Any leaven that may still be in the house, which I have not seen or have not removed, shall be nullified and become ownerless, like the dust of the earth." The next morning, when chametz can no longer be eaten (usually around mid-morning), the chametz that was found in the search is taken outside and burned. In some communities, this is done in large bins that are maintained by the local fire department, and in other communities individual families burn their own. After the burning of chametz, called ​bi'ur chametz, once again recite the following: "All leaven or anything leavened which is in my possession, whether I have seen it or not, whether I have observed it or not, whether I have removed it or not, shall be considered nullified and ownerless as the dust of the earth." Some also have the tradition of saying the following during the burning of the chametz: "May it be Your will, Lord, our God and God of our forefathers, that just as I remove the chametz from my house and from my possession, so shall You remove all the extraneous forces. Remove the spirit of impurity from the earth, remove our evil inclination from us, and grant us a heart of flesh to serve You in truth. Make all the sitra achra (side of impurity), all the klipot(kabbalah's term for "evil"), and all wickedness be consumed in smoke, and remove the dominion of evil from the earth. Remove with a spirit of destruction and a spirit of judgment all that distress the Shechina, just as You destroyed Egypt and its idols in those days, at this time. Amen, Selah." In some communities, the search is done with a knife and wooden bowl. The knife allows the searcher to thoroughly examine cracks and crevices for even the smallest morsel of chametz. In other communities, the lulav from Sukkot has been stored and is used instead of the feather to search for and collect chametz.